Clips discretely under the toilet seat, so the Eco Clip puts fragrance where you need it most, at the source. In the ladies room, when the seat goes down; it stays down, keeping the clip securely in place. Versatile with many other applications as shown. The Eco Clip's unique patent pending material contains 50x more fragrance than standard rimsticks and eliminates odors for 30 days. The restroom is a great place for the Eco Clip, which locks into place to eliminate odors and create freshness. 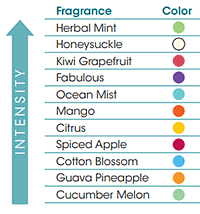 Containing 50x more air freshening than standard rimsticks, the Eco Clip gradually releases air freshener over 30 days. 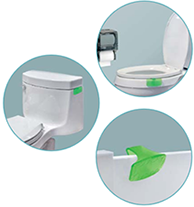 The clip works on the outside of bowls, (where the seat goes down and stays down), the tops of restroom partitions, or the side of tanks to combat odors and create freshness. 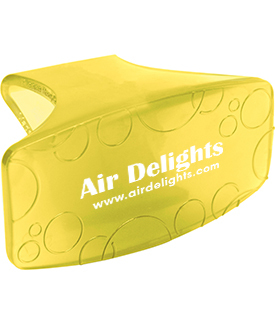 The clip is secures in place and shrinks to fit as fragrance evaporates, so it doesn't move after placement. Eco Clip is 100% recyclable, doesn't dissolve when wet, or pollute the water.